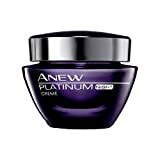 Avon Anew Platinum Night Cream – 1.7 Oz. : Drapes skin in a veil of plush softness. For women 60+, combats serious signs of aging. Contains Paxillium Technology designed to help increase Paxillin, a key skin protein responsible for youthful cell shape. Formulated to help restore youthful skin and recontour the look of sagging skin. AFTER 2 WEEKS neck and jawline look more defined and sculpted; wrinkles appear dramatically reduced. AFTER 4 WEEKS the cheek area looks lifted and reshaped. Dramatically reduces the appearance of sagging skin. OVERTIME dramatically reshapes skin for a more youthful-looking profile.